MoJo Promotions supply a excellent collection of personalised block products, all created to be custom printed with your logo. 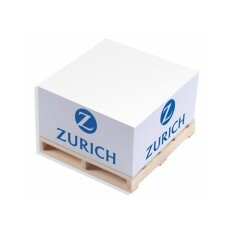 Block Products provide a wonderful way to display your brand. The goodwill created by personalised block products is guaranteed to ensure your marketing targets are met. Our selection includes - Square Pallet Block Pad - Smalls. All of our goods can be custom printed to suit your ideas, please contact us for more information. Supplied on wooden pallet. Personalised to all 4 sides. 500 sheets of white paper.